How Much Will Clients Pay? Elaine Biech is president and managing principal of ebb associates inc, an organizational development firm that helps organizations work through large-scale change. 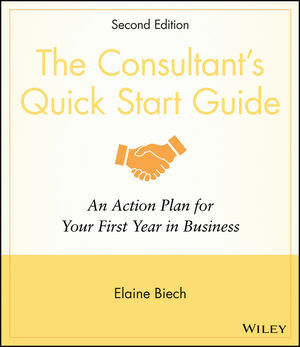 Biech has been in the training and consulting field for thirty years and is the author and editor of four dozen books and articles, including Pfeiffer Annuals of Training and Consulting, 90 World-Class Activities by 90 World-Class Trainers, Training for Dummies, The Business of Consulting, Second Edition, and Marketing and Selling Your Consulting Services, all published by Wiley. Biech is the recipient of ASTD's highest honor, the Gordon M. Bliss award. 1. First Things First: Why Consulting? Pull It Together: Your Initial Consulting Focus. Entrepreneur Attitude: Do You Have What It Takes? Quick Start Action: A Baker’s Dozen Questions to Ask a Consultant. 2. Planning Your Consulting Future. Will Consulting Lead You to Your Life Goals? Professional, Financial, and Personal Considerations. Identify the Changes You Will Have to Make. Quick Start Action: Create Your Personal Expense Plan. Put a Price on Your Head. Quick Start Action: Setting Your Fee. So What’s It Take to Get off the Ground? Find the Best Accountant and Attorney. Quick Start Action: Find an Accountant and Attorney. Explore Your Banking and Insurance Needs. Check Local Zoning Laws, Licenses, and Taxes. Quick Start Action: Your First To-Do List. Plan to Use Your Business Plan. Quick Start Action: Plan a Review. 6. Make the Switch Painlessly. Gain Consulting Experience Before Leaving Your Job. Quick Start Action: Plan with Your Family. 7. Setting Up Your Office. Quick Start Action: Preparing Forms. Quick Start Action: Is There a Client Base? Marketing on a Shoestring Budget. Tips to Become a Better Marketer. 10. Surviving the First Year. Did You Hear the One About the Consultant . . . - Developing a Personal Ethics Statement. 11. So, Now What? Year Two and Beyond. Quick Start Action: Review Your First Year with Your Family. Quick Start Action: Review Your First Year with a Colleague.